For many years, I had procrastinated from Dim Sum at Yauatcha. Call it a mixture of skepticism and stubbornness, but I had never bought into the idea of ‘Posh’, Michelin starred Dim sum (… well until now that is). When I think Dim Sum, I think of a budget meal with friends & family round the table and staple, familiar classics. Your ever-reliable Siew Mai (Steamed Prawn and Pork Dumplings), Char Siew Soe (Baked BBQ Pork Pastries) and Loh Pak Ko (Fried Turnip Cake) come to mind. No messing around with overcomplicated, haute creations that one needs to pay through the nose for. 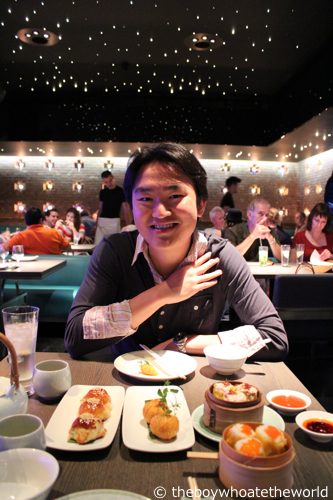 But if there is one restauranteur who knows how to make Asian food work from cheap-n-chic all the way upwards to more upmarket cuisine, it’s Alan Yau. Yauatcha’s interior has Yau’s trademark chic’ contemporary style written all over it. Dark wood, grey bare-brick and black glossy surfaces juxtaposing yet blending in with one another… cobalt blue glass against turqouise leather upholstery…. all under a surreal starry-night lit ceiling. It’s a Taipei tea-house with a difference and the ambience alone is arguably worth the extra dough you need to cough up for a meal here. Expensive it is… almost 2x your normal Dim Sum meal elsewhere. But in truth, most of the dishes were right on the money. Some of the more classic dishes we ordered stayed surprisingly true to the real deal with the quality of the raw ingredients revved up and turbo charged. 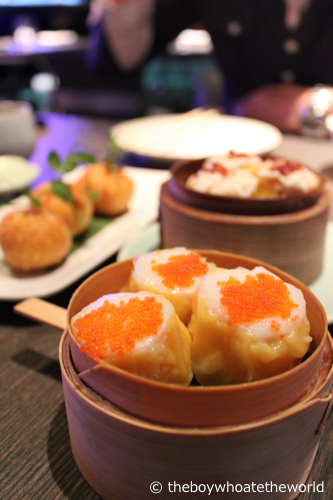 Scallop Siew Mai for instance was topped generously with piles of juicy fish roe…. 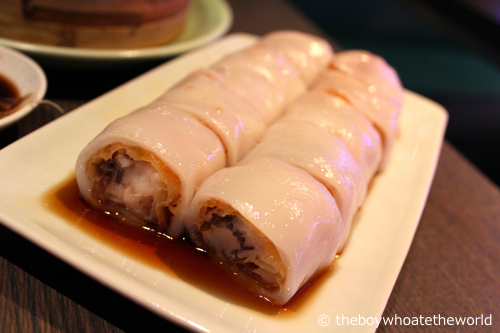 Prawn and Pork Siew Mais were also stuffed full of gorgeously sweet blue swimmer crabmeat. 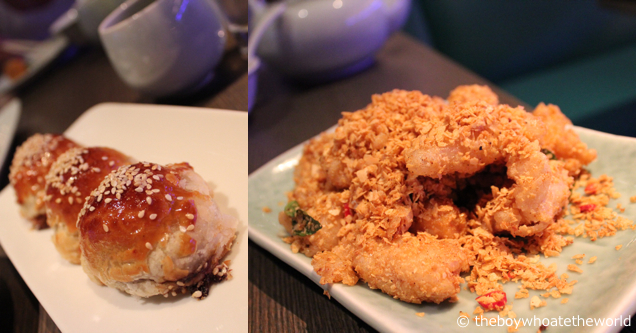 If I had to pick, the one ‘just-average’ dish was their Prawn and Beancurd Cheung Fun… a case of over-refinement, with too-much-prawn-filling vs too-little-rice-noodle-dough in the balance if you ask me. But it was their more contemporary and inventive Dim Sum dishes which I found even more impressive. A spin on classic Pork Char Siew Soe, their Baked BBQ Venison Pastries had a yum-meh depth of flavour in the filling which went on and on (and on). Buttery, flaky pastry and freshly toasted sesame seeds were the icing on the cake. Also very decent was their Chilli fried Squid, made with a crunchy batter of sweet, deep-fried oatmeal spiked with Curry leaves and Birds-eye chillies. Portion-wise, it was rather large and clunky for 2 to share, but it was such a comforting dish that reminded me of one I grew up eating as a child which all Malaysians will know… Deep-fried, Nestum cereal butter prawns! And who can forget their B-E-A-U-tiful Duck and Pumpkin puffs, presented as ginourmous deep-fried pods, sprouting green shoots. The filling was an explosion of rich, savoury duck and sweet, melt in the mouth pumpkin. Amazing, and probably my favourite dish of the lunch. Service was what you would ask of a 1 Michelin starred institution – friendly, professional and attentive without being intrusive. They’ve even drilled their mainly Western waiting staff to properly pronounce the Chinese dishes and teas on the menu (such a simple thing which so often gets forgotten in other places flying an up-market Chinese cuisine banner). Damage on the whole was actually less that I was expecting with the bill coming to under £60 for 2 (no booze, but a nice pot of some exotic Chinese blend tea I had never heard of before thrown into the mix). All in all, it was happy days. I must say I’ve been converted… Posh Dim-Sum does exist after all. You just need to know where to find it. ohhh i LOVE yautcha! the venison puffs and pumpkin duck things are my ultimate faves too. do try the mushroom cheong fun next time…delicious stuff. and the jasmine kumquat tea!…they used to do lovely macaróns and cute little desserts too….hvn’t seen any recently..which is a shame. Jade: That Duck and Pumpkin puff is the bomb!! Will give the Mushroom Cheong Fun a try next time (wasn’t particularly impressed with the prawn and beancurd one tbh). I order the chilli fried squid for the EXACT reason – it reminds me of nestum prawns! SuYin: Wish I had a deep-fat fryer to try out some of the nestum prawn recipes I’ve seen online!! You seen Nestum in London around anywhere? – can’t recall ever seeing it. even though i dont’ like dim sum in general, i LOVE their venison puff 🙂 i would have a meal there just to have that!! 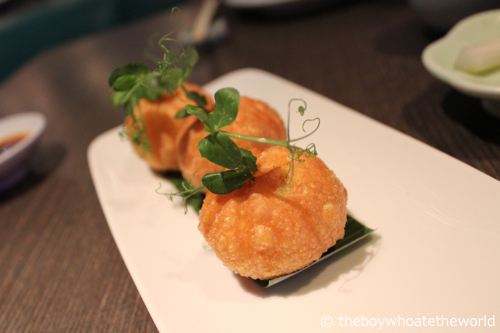 their proper dishes aren’t v impressive though, you have to stick to the dim sum at yauatcha! Nicola: Hey!! how’ve you been? long long time! yeah, love their venison and duck & pumpkin puffs as well…. Have never had the non-dim-sum dishes tho… have had Hakkasan which I presume is very similar and agee, it ain’t that impressive. 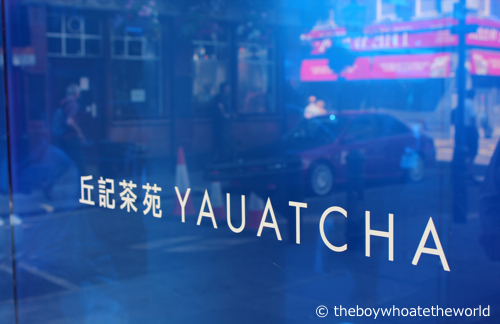 Yauatcha has a good concept and tastes decent but isn’t the Michelin star status questionable? Royal China Club and Min Jiang (maybe) could be in contention for a Michelin star if Yauatcha has one. Then again its good that they are not. Have you been to Royal China Club, Min Jiang, Princess Gardens of Mayfair and Pearl Liang? What did you think of them? Nakas: Love Pearl Liang and Princess Gardens – 2 of my other fav dim sum haunts. But probably can’t match chic ambience or service at yauatcha in my opinion. Princess Gardens probably has best value and bang for buck, always surprised how reasonable check is. Never actually had dim sum at Min Jiang before, only larger dishes / dinner. Quality was great, but a bit pricey and stiff for my liking i find.